Fodor's just released its 2013 Hotel Awards, which honor hotels in a variety of categories. The travel guide's senior editorial team selects winning hotels from more than 4,000 nominations sent by contributors around the world. 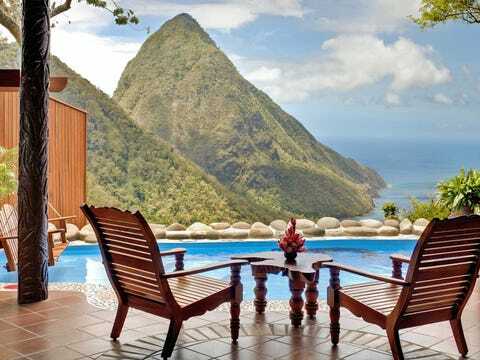 The 13 resorts recognized as top Exotic Hideaways — defined as "destination hotels for a trip of a lifetime" — provide unparalleled service in incredible settings, giving their guests an unforgettable experience. From Caribbean cliff-top dwellings to a lodge that puts a spin on the safari experience, this year's list offers a huge variety of options for travelers willing to splurge on their next luxurious getaway. 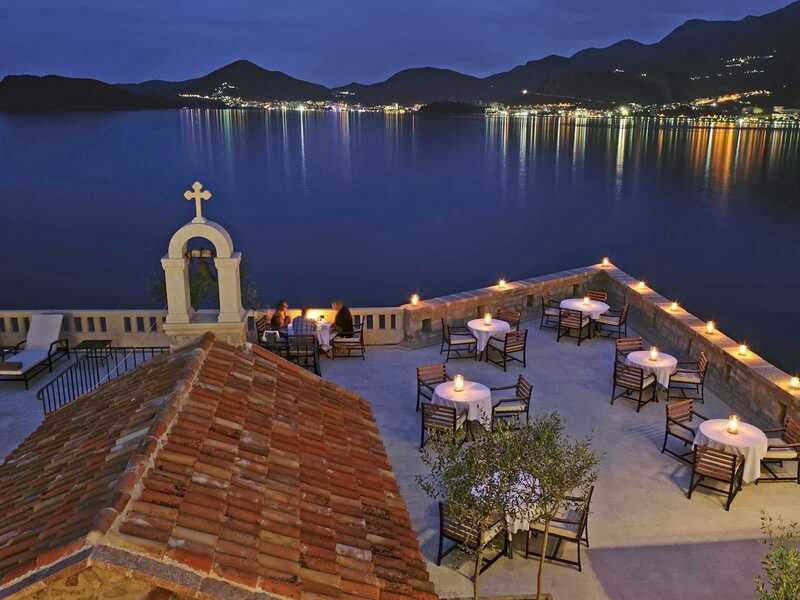 This island complex is essentially its own medieval village. Nestled within defensive walls from the 15th century, its 50 rooms, suites, and cottages — some of which served as a summer residence for Montenegrins in the 1930s — are perfect for those looking for an escape back in time. Spas, private pools, and a fine pebble beach sweeten the deal. 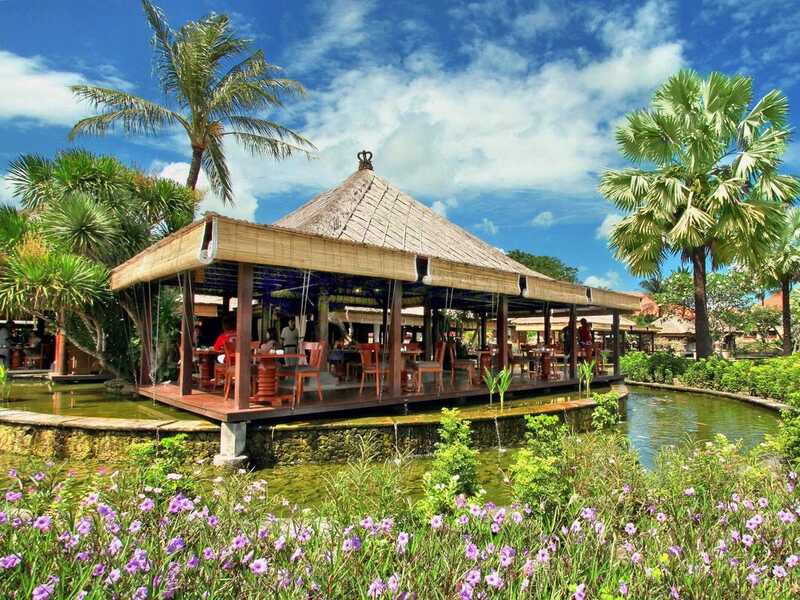 This cliff-top resort in the island's upscale Jimbaran Bay offers unforgettable views and a traditional Balinese experience. Rooms are decorated with local textiles and handicrafts, and the indoor/outdoor accommodations mirror those found in traditional homes. With an award-winning spa, private beach, Kids Club, several swimming pools, and seven restaurants to choose from, you may never have to leave the property. 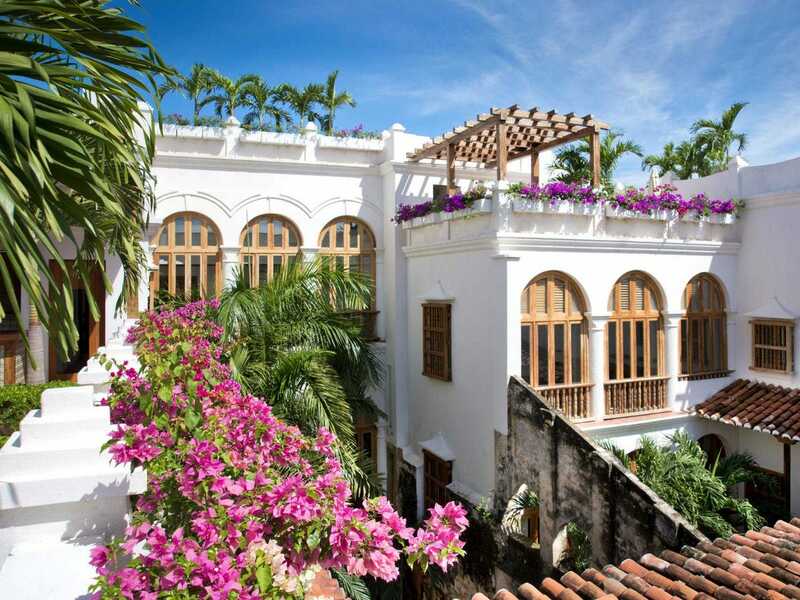 Situated smack-dab in the middle of Cartagena's UNESCO-protected Old Town, this hotel is an ideal home base for exploring the white-washed, flower-filled streets for which the town is known. Each of the 31 rooms has its own layout and view, some with private gardens or pools and others with exposed wooden beams, frescoes, and other original architectural details. In the same way the Lytro camera allows photographers to tweak the focus of their shots in post-production, this multi-camera array, developed by researchers at the Fraunhofer institute, allows directors to adjust the depth of field, the aperture, and even the camera angle of a given shot after it's been captured. The phrase 'fix it in post' now has a whole new dimension. 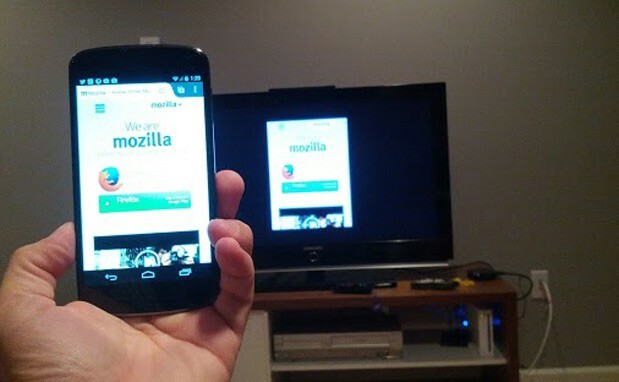 Maybe this is Mozilla's retort to Google's Chromecast, maybe it isn't. Either way, the end result certainly looks similar. Details are scarce, but an enigmatic Google+ photo shared by insider Mark Finkle clearly reveals some sort of wireless tab mirroring between a Nexus 4 and a Roku box. We're going to hazard a guess that it's being orchestrated through the web, rather than merely being based on WiFi Direct or a similar device-to-device protocol. In the same manner as Chromecast or Apple's AirPlay, this could allow the Firefox-running smartphone to be used independently from what's shown in the display -- so, for example, it could work as a keyboard or a remote control at the same ti! me as fe eding content. Anyway, there's a limit to how much we can glean from a single pic (could that be a DVD-VHS combo player on the shelf? ), so we've asked Mozilla for a bit more detail and will update this post if we hear back. 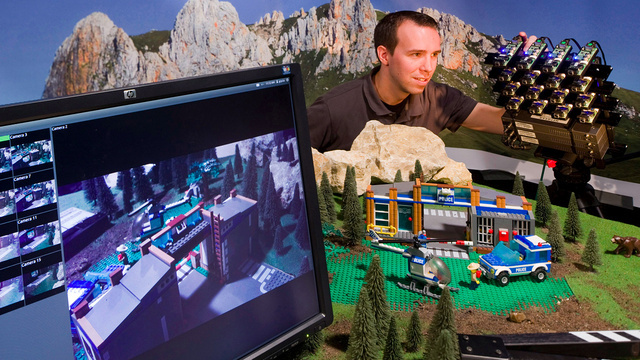 "We are conducting some experiments around second-screen support with a number of devices. But this is at investigation stage and we have nothing to announce at this time." Particle accelerators range in size from massive to compact, but researchers from Stanford University and the SLAC National Accelerator Laboratory have created one that's downright miniscule. 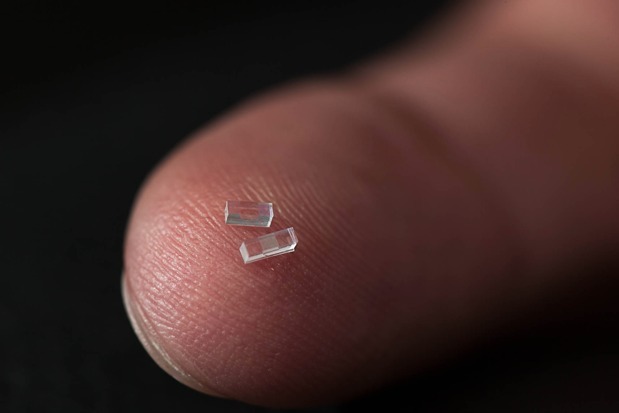 What you see above is a specially patterned glass chip that's smaller than a grain of rice, but unlike a broken Coke bottle, it's capable of accelerating electrons at a rate that's roughly 10 times greater than the SLAC linear accelerator. Taken to its full potential, researchers envision the ability to match the accelerating power of the 2-mile long SLAC linear accelerator with a system that spans just 100 feet. For a rough understanding of how this chip works, imagine electrons that are brought up to near-light speed and then concentrated into a tiny channel within the glass chip that measures just a half-micron tall. From there, infrared laser light interacts with patterned, nanoscale ridges within the channel to create an electrical field that boosts the energy of the electrons. In the initial demonstration, researchers were able to create an energy increase of 300 million electronvolts per meter, but their ultimate goal is to more than triple that. Curiously enough, these numbers aren't even that crazy. For example, researchers at the University of Texas at Austin were able to accelerate electrons to 2 billion electronvolts over an inch with a technique known as laser-plasma acceleration, which involves firing a laser into a puff of gas. Even if Stanford's chip-based approach doesn't carry the same shock and awe, it seems the researchers are banking on its ability to scale over greater distances. Now if we can just talk them into strapping those lasers onto a few sharks, we'll really be in business. 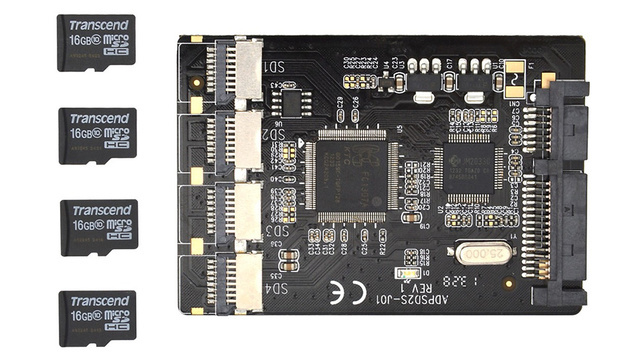 Instead of giving your unwanted memory cards away to your parents, or putting them someplace safe where they'll inevitably get lost, this easy-to-build kit lets you turn a bunch of unused microSD cards into a far more useful SSD drive. 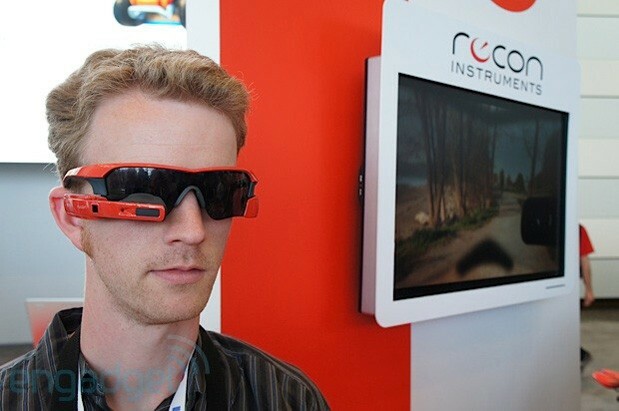 If you thought that Google Glass was the only wearable backed by one of tech's mega corporations, think again. Intel's investment arm has now ponied up a "significant" investment into Recon Instruments, makers of the Jet heads-up display for extreme sports. While neither party has disclosed how much cash Intel has thrown Recon's way, the release does reveal that the Intel Capital will be sharing its expertise in "manufacturing, operations and technology" in addition to its checkbook. While it's far, far too early to presume that we'll see Santa Clara dive head-first into the weara! bles mar ket, we're going to be watching this partnership with extreme interest. LG had its own Ultra HD news to reveal here at CEDIA 2013, and first up are two new edge LED lit LCD TVs joining the family. 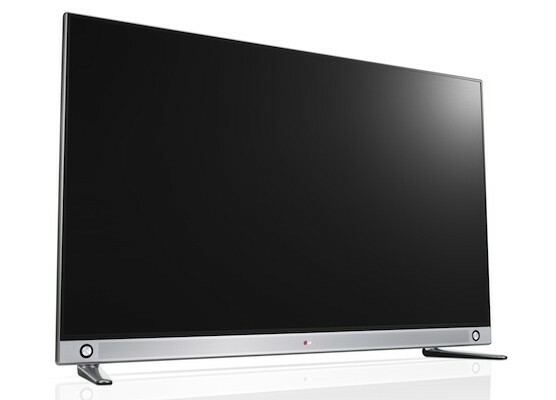 The cheaper models the company announced in Korea last month are coming to the US this month, with the 65-inch LA9650 (shown above) rocking a $5,000 price tag, and the 55-inch coming home for just $3,500 -- even less than we'd expected. Coming along with the new TVs is an LG "Sound Plate" it first showed off at IFA (pictured after the break). There's no price or release date yet, but expect it to hit in Q4. Beyond the new TVs, LG is also slashing prices on its existing lineup, with the higher end LA9700 models in the same sizes dropping to $6,500 and $4,500. Concerned about needing HDMI 2.0 in the future? 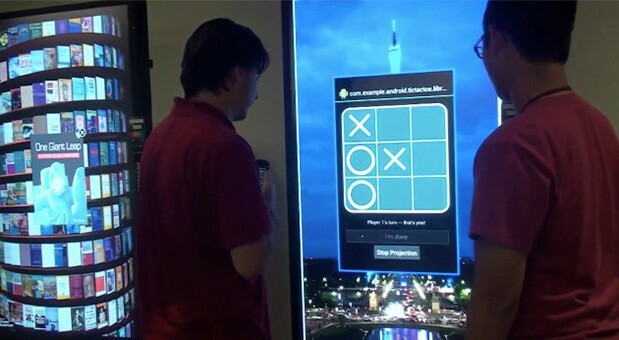 We don't have firm answers yet, but LG says it's working on a solution for existing models. Even its 55-inch curved OLED TV is getting a price break, dropping down to $10,000 at retail from its previous launch price of $14,000. Apple's newest top iPhone, the iPhone 5S, has arrived. 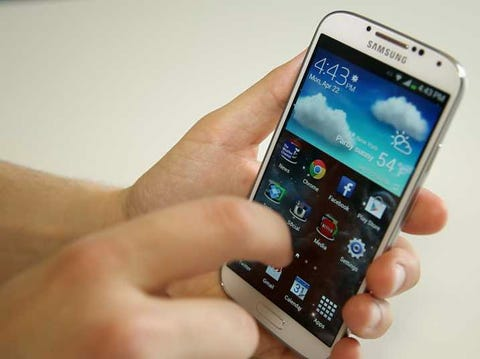 Early reviews have been really, really good, but how does the 5S stand up against its biggest rival, the Samsung Galaxy S4. 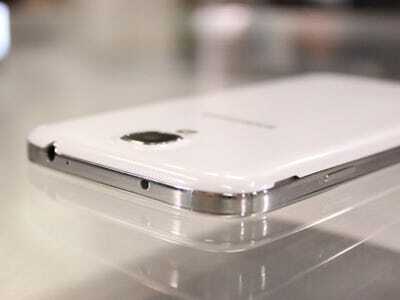 There are actually a bunch of things Samsung's phone can do that the iPhone 5S can't. Take a look. It has a built-in infrared blaster that can be used as a universal remote to control your TV. (The IR blaster is that little black dot at the top of the phone.) The phone also has a special app that pulls in data from your cable or satellite provider and can suggest shows you may like to watch. 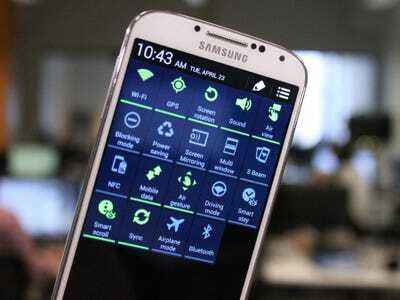 It has a near field communication (NFC) chip that lets your phone talk to other devices with NFC. This means you can use your phone to make mobile payments, swap content like photos between phones just by tapping them together, or pair your phone with a stereo with a tap. You can add extra storage to your Galaxy S4 if you insert a standard Micro SD card. They're pretty cheap too. You can add an extra 32 GB of storage for about $20. Blake Lively wants to be a "Gossip Girl" no more! The 26-year-old wife of Ryan Gosling announced today that she is launching a lifestyle brand "in a few months." "I have so many passions outside of acting and things that I grew up being good at and that I don't utilize when acting," the actress told Vogue UK. "Acting was something that my family did so I just kind of got into it by default, but there was so much that I cultivated, thinking that I wouldn't be an actor." Lively continued, "The main element of it is that it's about storytelling and it's about living a very one-of-a-kind, curated life, and how to achieve that." Apparently, that means distancing herself from the CW show that made her famous. While Lively insists "There's nothing like [her new company] out there, it's without! a genre ," the idea sounds similar to Gwyneth Paltrow's weekly lifestyle newsletter, "Goop" — which promotes the "Iron Man" actress' cooking tips, recipes, clothing, favorite travel spots, relationship experts, and more. Whether you're trying to score a coveted pre-order or you're just keeping track of the news, nobody wants to sit around refreshing a web site until it changes. 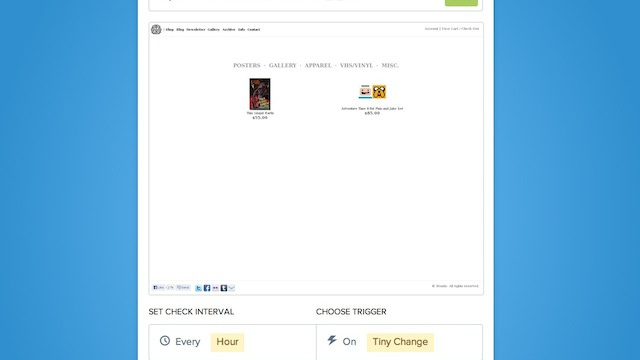 VisualPing is a simple service that monitors for changes to a site, and then sends you before and after screenshots once the site changes. Change detection on web sites certainly isn't new, but VisualPing does things a little differently by monitoring the actual visual look of a site. This means it's great when you're waiting around for product launches or for updates to a page that doesn't have RSS. Simply set up the interval for it to check, how much a change you want it to watch out for, and then VisualPing does the rest. Remember when dual camera modules on smartphones were all the rage? Toshiba is bringing them back -- only this time with technology that you're much more likely to use. Its new module uses two 5-megapixel cameras to record depth and images at the same time, producing a "deep focus" picture where everything is sharp. The technique offers a Lytro-like ability to refocus, even after you've taken the shot; it also provides gesture control and very fast digital autofocusing. You'll have to wait a while before you're snapping deep focus vacation photos, though. Toshiba doesn't expect to mass produce the sensors until April, and finished products will likely come later. Here at CEDIA 2013, Sony has just announced three new SXRD projectors, including two 4K models and one for the 1080p crowd. If you must have the highest res video output, only the new VPL-VW1100ES and VPL-VW600ES will do, with both tossing a DCI-approved 4,096 x 2,160 pixel count at the nearest display surface. The VPL-VW1100ES updates the VPL-VW1000ES introduced two years ago and remains at the top of Sony's projector line, bringing a bundled 4K player for a tidy $28,000. The VPL-VW600ES (pictured above) arrives with similar specs to the model introduced in Europe last month, offering that high pixel count with lower brightness and contrast levels in a smaller frame. As a result its $15,000 pricetag is lower too, although an option to bundle the FMP-X1 4K player and tablet controller will add an extra grand on top of that. If your display space or budget aren't 4K ready yet the VPL-HW55ES continues Sony's 1080p line with "enhanced optical efficiency" and an improved cooling system that should make the lamp last longer, all for a price of $4,000. All three projectors are going on sale through custom installers this fall, with the VPL-HW55ES due in October and the VPL-VW600ES in November. If you're looking for the top of the line VPL-VW1100ES however, you're encouraged to check back in October to set up that service appointment. Check after the break for the complete specs, we'll get an in-person look at all three shortly. Lucas Duplan announced a monstrous $25 million seed round in June for a mysterious payment app, Clinkle. Duplan still isn't ready to reveal to the world what his payment startup actually does, or how it's different than all the solutions that currently exist. But he recently won over a new investor, Richard Branson and the mystery of his startup has attracted more than 100,000 people to its waitlist. 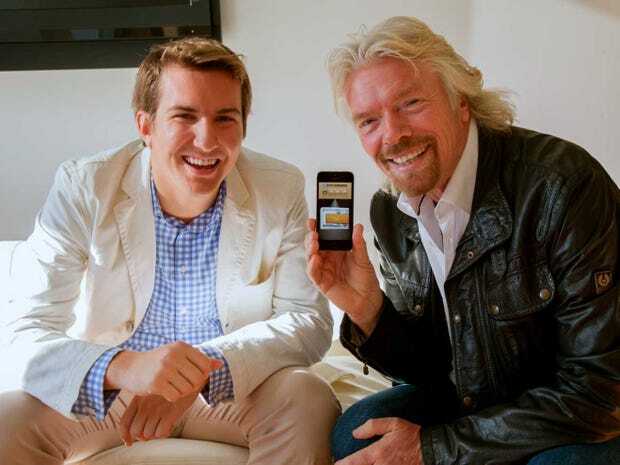 Branson said he's "excited to be part of the Clinkle revolution" in a release. Duplan also spent a lot of time creating a strange ad that teases Clinkle and will be running on the company's website. He told AllThingsD he spent "more [time] than he should have" on the ad that shows people with missing body parts. It kind of reminds us of Kevin Bacon's movie, Hollow Man. Clinkle: We’re All In This Together from Cl! inkle on Vimeo. Be it PCs, phones, televisions or wearables, if it can go wireless, Broadcom wants in on the action. Today the company has added one more category to that list, and it's the car. Indeed, its new line of wireless chips is specifically catered for automotive use, and is decked out with the latest 802.11ac WiFi and Bluetooth Smart Ready technologies for smoother streaming between mobile devices and in-car displays. But the technology's scope doesn't stop there. 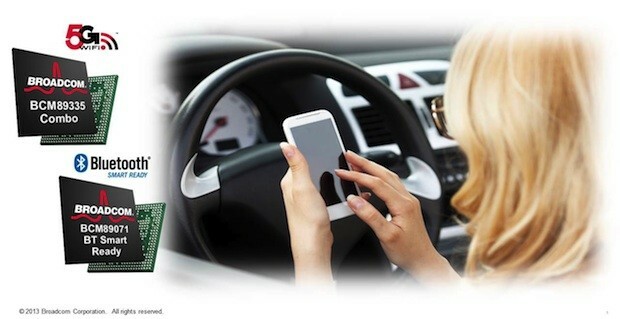 You could also use it for smartphone remote control of your vehicle's settings, high-speed connectivity via LTE hot spots, vehicle-to-infrastructure communications and even the syncing of biometric data to make sure the driver isn't fatigued or drunk when he or she's behind the wheel. 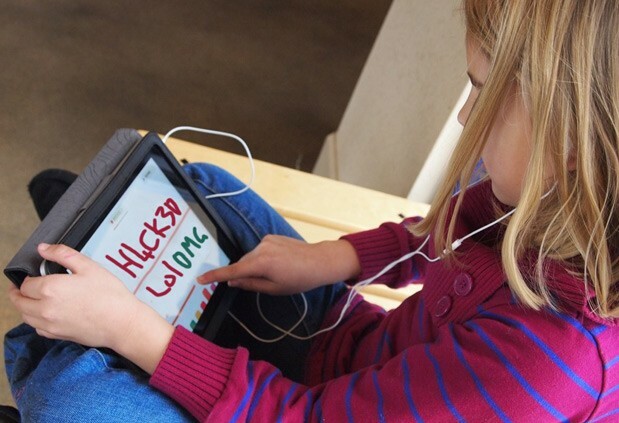 Just a week after it began the first phase of putting iPads in the hands of all 640,000 students in the state, the Los Angeles school district already has a fight on its hands. In a matter of days, 300 children at Theodore Roosevelt High School managed to work around protective measures placed on the Apple tablets, giving them complete access to features -- including Facebook, Twitter and other apps -- that should otherwise have been blocked. Students bypassed the security lock on the device by deleting a personal profile preloaded in the settings -- a simple trick that has the school district police chief recommending the board limit the $1 billion rollout before it turns into a "runaway train scenario." For now, officials have banned home use of the iPads while they assess ways to better restrict access -- they would have gotten away with it, too, if it wasn't for those meddling kids. Graphics cards aren't normally our go-to choices for audio processing, but we may have to make exceptions for AMD's just-unveiled Radeon R9 and R7 lines. The R9 290X (shown above), R9 290 and R7 260X (after the break) will support TrueAudio, a new programmable pipeline that enables advanced audio effects without burdening a PC's main processor or a dedicated sound card. Not that the range will be lacking in visual prowess, of course. While the company isn't revealing full specifications, it claims that the R9 290X flagship will have five teraflops of total computing power versus the four teraflops of the previous generation. The boards will ship sometime in the "near future," with prices ranging from $89 for an entry R7 250 to $299 for the mid-tier R9 280X. 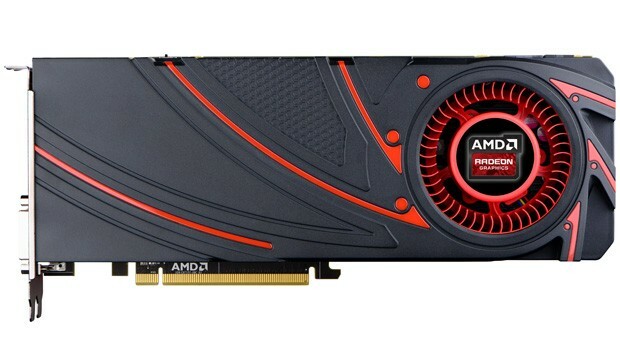 AMD isn't divulging the R9 290X's price, but pre-orders for the card will start on October 3rd. The firm has also revealed a new programming interface, Mantle, that makes the most of the Graphics Core Next architecture found in many of its recent processors and video chipsets. Developers who build the low-level code into their games should get better performance from GCN-based devices without having to re-optimize for each platform -- a title meant for Radeon-equipped PCs should still behave well on a PlayStation 4 or Xbox One, for instance. Mantle will debut on Windows through a December update to Battlefield 4, and should spread to other platforms in the months ahead. 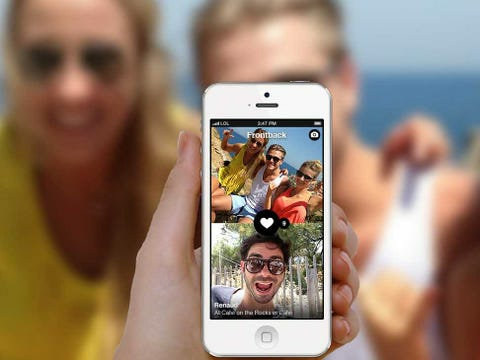 For the last month or so, we've had a photo app called Frontback on our radar. Despite the over-saturation of the photo-sharing space, it seems to be catching fire. It's had 200,000 downloads recently. Why? Maybe because it takes the embarrassment — or at least reduces the egomania — out of snapping a selfie. The idea is simple: You take a picture of whatever you're looking at with the back camera of your phone and then get yourself in on the fun by snapping a selfie with the front camera. The app automatically stitches the two together, one on top of the other. So, "Thing," followed by your reaction to said "Thing." Your selfies become more meaningful because a Frontback image will show people what inspired the selfie in the first place. We decided to try it out. 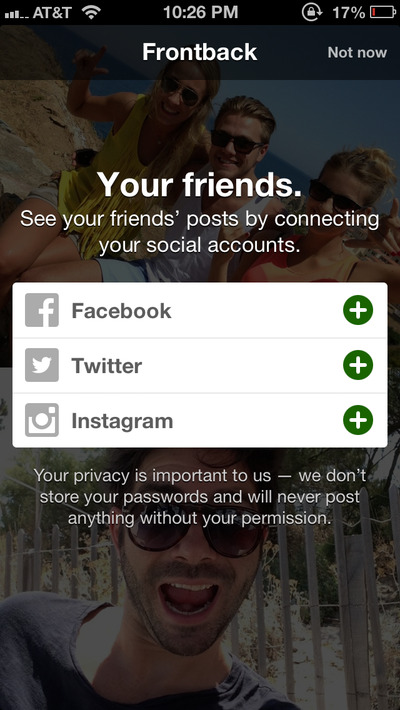 Like most social media sites, you have to create a username and register before getting started. 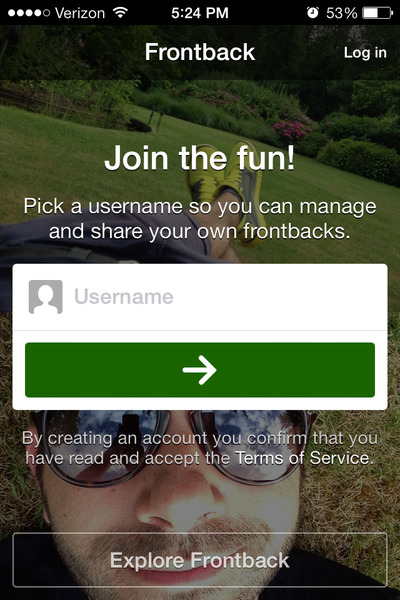 As a new user, you're encouraged to find your friends who are already using Frontback, or invite them to join. 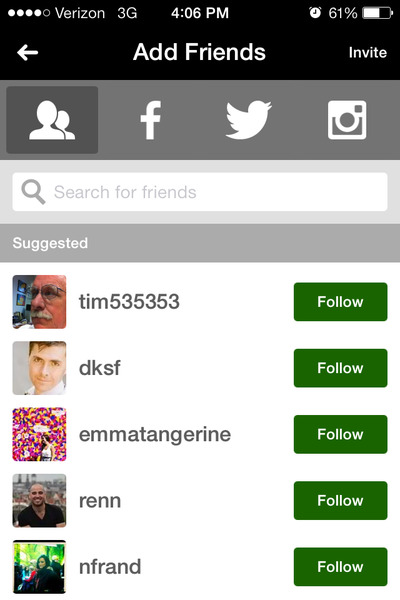 You can see potential friends via your contact list, Facebook, Twitter, or Instagram.